...well, not twenty years ago today exactly to be honest, but bear with me. Over recent months there has been a lot of focus on the digital availability, or lack of, of The Beatles back catalogue. There has been endless speculation that the settling of lawsuits between Apple the computer company and Apple the Beatles music company might herald the iTunes exclusive availability of The Beatles music. EMI's announcement of DRM-free downloads also prompted speculation that this was in preparation for premium Beatles downloads being made available. It is, after all, in The Beatles' interest to make the material available sooner rather than later, as they face a ticking royalties time-bomb with their earliest recorded performances going out of copyright in six years time. And with the 40th anniversary of the landmark Sgt Pepper's Lonely Hearts Club Band due to be celebrated, if that's the right word, by a load of modern day Beatle-wannabes recreating the album, and the release last year of the Beatles' own remix album, "Love", you'd be forgiven for thinking that the band never went away. So I wanted to draw your attention to another Beatles anniversary this year - it is twenty years since The Beatles back catalogue was issued for the first time in the then new-fangled compact disc format. In truth though, by the time The Beatles catalogue hit the shops, the CD format was no longer new, and had long since passed the stage where people on TV were smearing them with jam and pretending that they would last forever. The CDs were released in batches during the course of 1987, starting in February, and it is interesting to contrast how it was handled as a reissue programme then, with how you'd expect the CDs to eventually be digitally remastered and reissued after the inevitable online issue of the material. 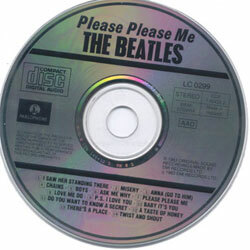 The original Beatles CDs featured no bonus tracks, no alternate mixes, and no liner notes, unless liner notes had featured on the original vinyl sleeve. This compares unfavourably with the treatment for other rock legends. 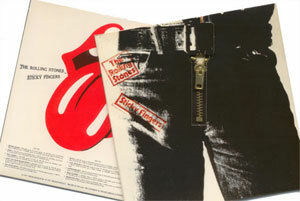 When Virgin, for example, acquired the rights to The Rolling Stones 70's catalogue, they released the CDs in special packaging that replicated the original releases, even down to the metal zip embedded in the sleeve of Sticky Fingers. 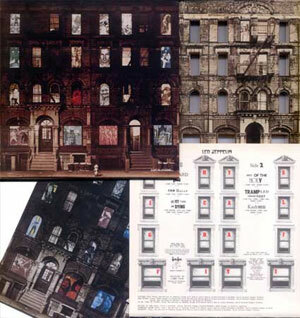 Led Zeppelin's back catalogue, meanwhile, is available in Japan in exact facsimiles of the original album sleeves, including tiny cut-out holes in the Physical Graffiti sleeve to enable you to change who appears in the building's windows, depending on which inner sleeve you place at the front. The Beatles were afforded no such luxury, and their packaging was stuck very much in the standard 1980s CD sleeve mould. 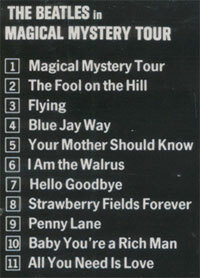 Track-listings on the back of The Beatles CDs, like most releases at the time, featured the track numbers highlighted in a standard box design - emphasising, as consumers made the transition from vinyl and cassette to the digital format, the programmable nature of the track-lists on CDs. The last page of CD booklets at the time generally featured a standard disclaimer about the advantages, care instructions and limitations of the format. The Beatles' CDs were no different. When they were first issued on vinyl, The Beatles albums were initially issued on the Parlophone label, and then, from 1968's The Beatles double-set onwards, on the Apple record label. 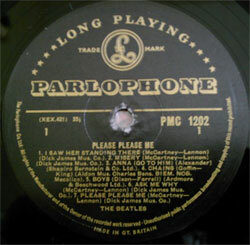 Stereo copies of their first album in excellent condition were worth a four figure sum in the 1990s if they were one of the few pressed with the old gold style Parlophone label, rather than the black and yellow style label that was introduced around the time that "Please Please Me" was released. None of this was reflected in the design of the reissued CDs, which featured plain black ink labels, where the "Compact Disc Digital Audio" logo took up as much, if not more, space as the label metadata did. The only release where this differed was with Sgt. Pepper's Lonely Hearts Band, where the CD label copy design remained the same, but was printed in red ink to match the red colour scheme of the famous sleeve. In fact Sgt. 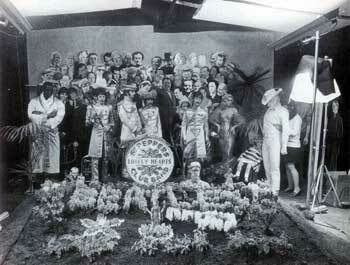 Pepper's Lonely Hearts Club Band was the only Beatles CD release where any significant effort was made on the packaging, given that the reissue programme coincided with the 20th anniversary of the release of that particular album. This came not just in a standard jewel case, but with a card wrap-around and an additional 24 page booklet featuring contributions from Peter Blake and George Martin, and photographs of the famous sleeve photoshoot being assembled. This was still a far cry from the innovation when the album was released in 1967, when it became the first vinyl pop record to be released in a gatefold sleeve, with a dedicated inner sleeve (a red, pink and white psychedelic print on the inner bag), and the first to have the song lyrics printed on the sleeve. Plus it came with a free sheet of cardboard cut-out badges, picture cards and a fake moustache, which were also reproduced in the CD package, albeit not on card - and with the booklet page numbers printed across them. There has been some speculation that under the new UK chart rules, the entire Top 40 could get clogged up with Beatles tracks when they are finally unleashed upon the download market. The evidence from 1987, looking at the chart impact of the CD reissues, suggests that this is unlikely. Only two albums breached the top twenty. The Beatles, usually known as The White Album, hit #18 in September of 1987, and, with all the hype surrounding the 20th anniversary of the original release, Sgt. Pepper's Lonely Hearts Club Band re-entered the charts at number 3 in June 1987. "Beatles For Sale", "Help! ", "Rubber Soul", "Revolver", "Magical Mystery Tour", "Yellow Submarine" and "Let It Be" all failed to make a renewed impression on the UK charts when they were digitally issued for the first time. There is a significant difference as well between the physical digital format in 1987, and the virtual digital format in 2007. In 1987 it wasn't possible for consumers to have already converted their own Beatles back catalogue to the new CD medium - domestic CD burning technology was years away. In 2007 however, consumers have already had plenty of time to produce their own digital files from their Beatles CDs, and to make them DRM-free and of a higher quality than those that will make up an official digital download release. Over the years the range of Beatles compact discs has expanded, to include the "Number 1" album, the Anthology series, the BBC Sessions discs, the 'naked' version of "Let It Be", the songtrack version of "Yellow Submarine", and the aforementioned "Love" remix album, and the packaging associated with them has also improved on the 1987 reissue offerings. This trend started almost immediately. Back in 1987, it was to be another 6 years before the "Red" and "Blue" Beatles compilation albums were to be reissued on CD. In order to mop up the odds and ends that didn't fit onto The Beatles proper albums, two new compilations were created the year after The Beatles CDs were first issued - March 1988's Past Masters Volumes 1 and 2. This compact disc, and its sister volume issued simultaneously, simplifies matters considerably. If you have the other 13 CDs, and these two, you have everything that the Beatles, the most successful artists in the history of recorded sound, commercially issued during their remarkable reign. These two sets gather together A and B-sides of singles, those special EP tracks, oddities like the Beatles' two German-language recordings, a song recorded primarily for the American market and another especially donated to a charity album. But don't fall under the illusion that these songs are mere "fillers". 'She Loves You', 'I Want To Hold Your Hand', 'I Feel Fine', 'We Can Work It Out', 'Hey Jude' and many others like then didn't exactly wallow in the lower reaches of the chart. 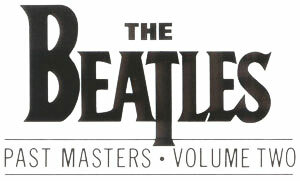 Despite containing exclusive and popular Beatles material, these discs also had a negligible impact on the album chart of the time, failing to reach the top 40 in the UK. However, in 2007, if Beatles digital downloads become available, one suspects it will be the non-album singles like "Lady Madonna" and "Hey Jude" contained on these volumes that have the most chance of denting the UK singles charts. I fully expect to see digitally remastered reissued physical Beatles CDs to follow a year or so after any digital download release. Hopefully this time the packaging will do justice to "the greatest song writers since Schubert", as Tony Palmer described Lennon and McCartney on the sleeve-notes to 1969's "Yellow Submarine" album. And the timing of The Beatles catalogue becoming available digitally? Well, I wouldn't bet against the 40th anniversary of Sgt. Pepper being the date, on June 1st this year. This was a constant bane when I used to work in second-hand record stores. You could guarantee that once every six months a British newspaper would include an article about making money from your old household items, and as an example point out that the first The Beatles album was worth £1,000. Whilst neglecting to mention the rather important facts that it had to be i) in stereo (which most weren't as mono copies vastly outsold the stereo issue), ii) with the specific gold and black label (which most weren't as there were barely a thousand-or-so pressed using that label stock) and iii) it had to not have been played and scratched to death like every copy I ever saw was. By Martin Belam on 17 April 2007. A brilliant critique in my opinion - - as for me and my family and friends, when in doubt about what to play next, it has always been back to The Beatles...I look forward to all reissues. Forty years later, they remain THE GREATEST of all the Greats during the modern recording era! Excellent blog, well thought out and lots of graphics to illustrate your points. An enjoyable read and I agree with everything you say. I still think reissues and downloads would sell well . . . Traveling Wilburys seems to be going well at the moment but they were hard to get hold of I suppose. A mono version of Sgt Pepper would be interesting. I‘m not a fan of remixing the Beatles back catalogue. I must qualify this by first stating that I did enjoy the LOVE album. That release gave us brand new mash-up versions of the old songs completely supervised by George Martin and his son. In most cases the songs were remixed very different from their original counterparts. In that regard they were worth doing. I did not like what was done to albums such as the YELLOW SUBMARINE SONGTRACK. I feel that in remixing the songs the engineers may have gone too far. I have listened to the Beatles music for over 35 years, to the point where I can make out every instrument on every track and recognize its position in the mix, so to listen to the remixed YELLOW SUBMARINE album makes me wonder where all of this may go. We are now incorporating modern recording technology onto 1960s recordings. To make the sea move between the speakers on the song “Yellow Submarine” is going too far. This technology wasn’t available in the 60s, and I don’t see why it should be applied to Beatles tracks now. The obvious question is: where will it stop? George Martin himself oversaw the remastering of the CDs that were released in 1987 and they sound absolutely incredible! They are the original mixes from the original recordings. I only want the first four albums in mono because that is the way the were conceived and that is the way they should be heard. I also love the packaging and album liner notes from those CDs. They are what was written in the 60s and represent how the music was initially perceived without the benefit of hindsight. In the case of LET IT BE NAKED and 1, the sound was remastered and compressed to the point that all of the subtitles were squeezed out of the music. It is harsh, too loud and has a tinny sound to it. Beatles song remixed and remastered like todays music. I WOULD LOVE TO HEAR THE BEATLES ALBUMS REMIXED LIKE MODERN ALBUMS if possible !! If anyone wants to hear the music like it was "mixed" back in the 1960's, Well, We have that currently. I hope for new "REMIXED" and REMASTERED Beatles albums!!! Yes, mix them like "modern" albums. But, keep the "songs" the same. Don't add or take away any parts of the original performance !! I have been an avid collector of Beatle recordings for forty years plus, and hearing them remixed is close to an epiphany to anybody who loves their music ,why not take the genius and hear for the fist time what had time and technology restraints .I can hardly wait to hear everything having been teased by Let It Be -Love-and Yellow Submarine,it gives me chills just to imagine how great they really were and hearing it in digital sound could have no boundries for me ,you purists are idiotic for suggesting a halt be put on this project ,I would welcome a hologram in my front room if it were possible dont ever stop making this phenomenon better. This comment is for David (and anyone who doesn't know this). ALL of The Beatles albums were made to be heard in MONO except Abbey Road. You just mention the first 4 albums. The Beatles spent all their mixing time on perfecting the MONO mixes of every song, leaving the STEREO mixes to whoever was around to finish them up (almost an afterthought). STEREO was seen as a fad, until the late 60's when it became the norm. Sgt Pepper was intended for the world to hear in MONO! The mono Revolver is much more powerful, with many of the songs (slightly) longer than their stereo versions. Mono doesn't mean inferior at all! It's quite the opposite. As far as the the future releases go - I want the whole thing - mono and stereo versions of each album on 1 disc plus bonus tracks, and (for the special edition of each album) a DVD-Audio disc of the Advanced Resolution 2 track mixes in mono, stereo, AND remixed tracks. If they want 5.1 surround we'll take that too! Does anyone know if there is indeed any plans to release the original monaural mixes on cd? That is the way they were meant to be heard, and that should be made possible for generations to come. Look at the remastered Beach Boy's Pet Sounds album, and that's how remastered Beatles records should be released - full mono version, full stereo version. That's it. I agree with Rich - I want everything: the original mono and stereo mixes of every album (which appeared in both formats), plus remixes of every album (retaining the spirit of the original, but geared towards modern ears), and availability on high-resolution formats like DVD-Audio (using DTS) with 5.1 mixes where possible. Anything less than everything presented in the best possible manner is not good enough for The Beatles. Weren't all of the Beatles albums already remastered when they were released to CD in 1987? To my ears they sound great!!! Why does everyone want re-remastered CDs? I don't get it. The modern remastering on Let It Be... Naked and Yellow Submarine Soundtrack sounds horrible? Why would the Beatles mess with their legacy and remaster what is already perfect?!! "Weren't all of the Beatles albums already remastered when they were released to CD in 1987? To my ears they sound great!!! ..."
then you sir have the ears of a dullard. Have a listen to the original vinyl. Nope, my hearing is absolutely perfect. Maybe that's why the old CDs sound great to me. I can hear every single detail of the music. The original CDs sound exactly like my old vinyl records which is why I like them. I'm not a massive Beatles fan or anything. I feel that most modern CDs are not mastered to the tastes of many audio fans. These days most labels (most of the big ones anyway) use high levels of compression and a lot of clipping. The result is that everything sounds 'louder' and more consistent. This is perfect for radio play, and fine for a casual listener or someone listening in a noisy environment (such as at work). But if you've got a good home system and you like to sit down and listen in a quiet environment, and you care to use your volume control and turn it up loud, and absorb every subtle nuance of the music: the compression and clipping is going to be detremental to the audio quality. That doesn't mean it will sound worse for everyone. Some people even prefer it. And that's not to say modern remasters are 'inferior', they can sound fantastic. But for many people who are passionate about audio, modern mastering with its high compression and clipping is "evil", and late 80s/early 90s CDs are more respected. The only thing that really matters is how it sounds to each person. As for cover art, well, each to their own. I don't give a toss about cover art as I keep all my music on my computer. I have a pretty big CD collection, much of it spanning back to the 80s, so you tend to not care about outdated graphic design when half your CDs look rubbish anyway. I'm very much a person who believes music should be about music. Therefore the way a singer acts, or their styling, or graphic design, has absolutely no influence on how likely I am to listen to their music. Music for me is about sounds only. I guess I'm old-fashioned, like that. But I appreciate that for most people music is also about the person singing, or the direction of the video or the culture associated with the music. And finally I would like to mention preservation and nostalgia. As people have said, preservation of how something was originally supposed to sound is important. There are many people annoyed about them re-mastering old films and making them "better" by hyping them up and making pointless additions. And personal nostalgia is important, too. I have listened to some of my favourite songs from the 80s many times on CD and enjoyed them. But if I happen to hear them on a tinny radio, the nostalgia factor somehow kicks in more, even though it's a vastly inferior sound quality. So if you grew up listening to the Beatles hits on a tinny radio, who's to say the tinny radio isn't the best possible way to listen to those songs today? I for one welcome hearing the Beatles stuff in the fullest sound that modern technology can deliver.The yellow sub release is far superior to any previous release.The old stereo vinyl mixes are dire. We have moved on from the dansette, and should now get somewhere near the listening experience of a playback at Abbey Road, in our living rooms. I want the full monty please.monos, stereos and 5.1 and I will trust the team who worked on yellow sub songtrack to come up with the goods. The original analogue multi-track tapes were transferred to digital multi-track tape and then the tracks were remixed. With the massive improvement in digital technology (mainly better AD/DA converters) since the 80s, and the fact that the upcoming releases are true remasters in the now accepted sense of the word (ie. copies of the original mixes) I would be very suprised if they are not better, or certainly more faithful to thr original vinyl releases. This means that pretty much anyone listening to a Beatles track these days, is actually listening to a 1980s remix, unless they have the vinyl. At least they resisted the temptation at add synths! I know it is only done for money making reasons, but re-issues like this are often the only reason a new generation gets to hear the likes of Simon and Garfunkel for example. I for one think they are and always will be a great thing, for music in general. Of course as the previous comment said, this is done for money making in the first place, but this is true in all industries (or most). Movie remakes, 100's of new food products are created each year (how new are they? ), etc. But what I read and found quite amazing (and that I did not know) was that the Beatles will soon stop getting royalties on their music. Wow.